Discover how to find, gather, and use the most common edible and medicinal plants with a professional herbalist. Enjoy the enchanting greenness of Finnish summer, pure and fresh air, and get some gentle exercise while learning about the traditional use and benefits of the marvelous plants that grow wild in our woods and meadows. 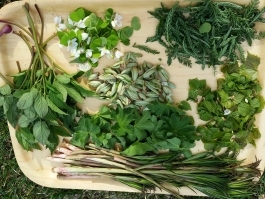 During the walk in beautiful surroundings of forests and meadows, you will learn about Finnish edible and medicinal wild herbs, their qualities and use, and where and how to pick them. Together we'll wildcraft some plants, which you can afterwards use for making a nice cup of herbal tea or a beautiful footbath. The plants will be selected with the help of the herbalist according to your state of mind and physical, emotional or mental needs. Let Lady's Mantle caress your skin, Yarrow improve immunity, gain strength with Nettle, allow Greater Plantain heal your wounds, Rosebay Willow herb your stomach ache, Raspberry leaves attend to your feminine side, Dandelion enhance your liver and relax with Pineapple/Scented Mayweed - and many more according to their natural availability! Price includes: Guided herb walk with professional guide and herbalist. Group size: 5-12 persons. Herb walk can also be arranged for smaller or larger groups, please ask for quotation. Clothing: Participants should have proper outdoor clothing and shoes. After the wild herbs walk described above, we'll continue to use the herbs in practice, either in herbal sauna, cooking, making simple natural cosmetics or arts & crafts! Price includes: Guided herb walk with professional guide and herbalist and chosen program. Group size: 5-10 persons. Herb walk with program can also be arranged for smaller groups, please ask for quotation. Clothing: Clients should have proper outdoor clothing and shoes.